Series exploring the world of food. Sheila Dillon digs up the remarkable story of how the potato changed the world - and offers us a world of comfort and deliciousness. 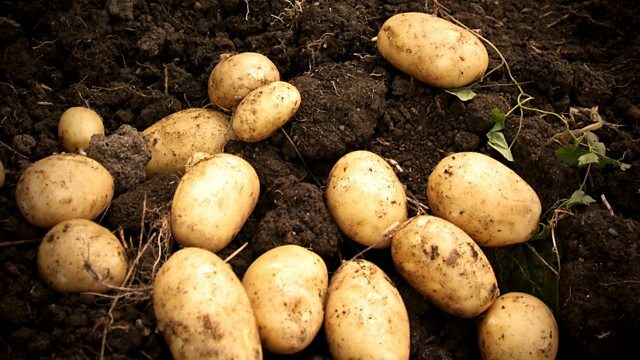 Sheila Dillon digs up the remarkable story of how potatoes changed the world, offer a whole spectrum of flavour, and might shape our food future. With Sheila are cook and food writer Anna Jones, Charles C. Mann - author of '1493 - How Europe's Discovery of the Americas Revolutionized Trade, Ecology and Life on Earth', and the potato revolutionary and agronomist Alan Wilson. Heat a splash of oil in a frying pan on a medium heat and fry the onion for about 5 minutes, until soft and sweet. Add the mustard seeds and stand back while they pop. Scoop out a heaped tablespoon of the onion mixture and put to one side to cool. With the pan still on the heat, add the turmeric and curry leaves and fry for another minute or so, then put the whole lot into a bowl to cool slightly. Add the mashed potato and lentils to the onions, then season and mix well. Wilt the spinach in a hot pan with a little oil then add this to the potato mixture. Divide the mixture into 4 portions and shape them into 4 potato cakes. Put them into the fridge to chill while you do a couple of other little jobs. a potato masher here), then stir in the tablespoon of the onion you set aside. Mix, then season well. To make your pickle, put the sliced cucumber into a bowl and add all the other pickle ingredients. Using your hands, scrunch the cucumber slices to get the flavours going. Now put your frying pan back on the heat. Take the potato cakes out of the fridge and fry them gently and carefully in a little oil for about 2–3 minutes on each side, until warmed through and crispy brown. Serve each dosa cake piled with the mustard seed, onion and mashed avocado and with a sprightly spoonful of pickle on the side. I ate this in a restaurant many years ago and have never forgotten it. It's a simple dish that uses my two favourite ingredients as the stars. I eat this with a herby salad on the side but it would sit well next to most dinners. It's a very flexible recipe, you can swap the fennel for other spices or woody herbs. And even add a little stock or cream can be added before baking too if you like. Preheat the oven to 200C/400F/gas mark 6. Scrub the potatoes and slice them as finely as you can, a mandolin can help here, you want them to be about 3mm thick. Cut the top and bottom off the lemon and then slice the remaining lemon into slices as thin as you can, keeping the rind on, you want the slices to be about the same thickness as the potatoes, the rind it will soften and sweeten as it cooks. Butter a shallow ovenproof dish and grease the inside with a little butter. Next lay the potatoes in a row of potato slices across the end of the dish, propped up a little. Against this row, lay a line of lemon, not as many as the potatoes, but 2 or 3 slices. Continue with potatoes and then lemon until you have filled the dish, shuffling the potatoes down a little as you go if you need to. Finish with a very good seasoning of salt and pepper and scatter over the fennel seeds. Dot the top with the butter. Cover with foil, and scrunch the edges to seal and put into the hot oven for around 30 minutes until the potatoes are cooked through. Remove the foil and continue to cook for 30–40 more minutes, or until the potatoes and lemons are browned and the lemons sticky and caramelised. Serve with a zippy lemon dressed salad.